Who wouldn't love to go on a workout vacation with all of their gym buddies to Italy for a week? There you can enjoy the sun and train together during the day, then eat delicious Italian food for dinner! An exclusive training area in heart of the holiday homes in Liguria, Italy. The access to the training area will be for free when you book your stay – wake up, train, eat repeat (and some beach time of course). In Liguria, Italy you can rent out a training space from 2 to 100 people and they even offer great accommodation close by. Mix up vacation and workout with your friends in the astonishing region where the opposites attract, from the tranquil mountain to the big and breaking waves on the beach, that are perfect for wind- and kite surfing. 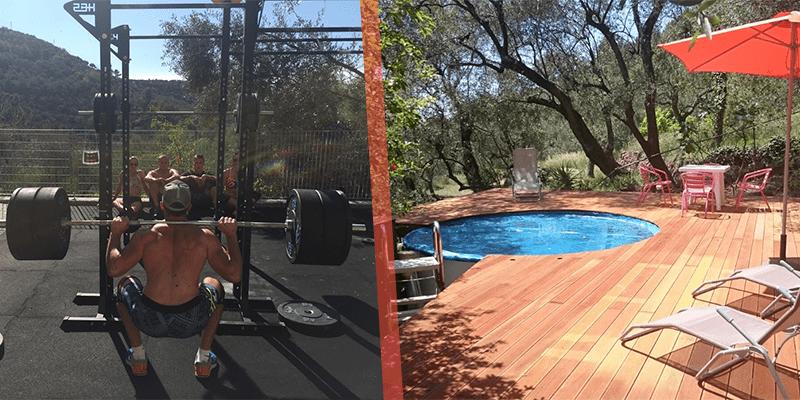 You can rent a holiday home and train whenever you want, as much as you want together with your training buddies, from 400 Euro/4 People/Week. Experience sand beaches and countless mountain bike trails right around the corner. There is a lot to do in the area so there should never be a dull moment. And more, just let your imagination flow free to find things to do. The facilities offer plenty of space for you to enjoy during your stay. When you want to take a rest day from training then the beach is close by where you can lay in the sun, or if you don’t like going to the beach, there is also a good shopping center where you can shop until you drop, like an amrap. The climate in northern Italy is known for being mild, and in Ligeria, it hardly ever rains. Every season offers different opportunities for activities and culinary experience. There are a lot of culture in Liguria. Plenty of beautiful churches, museums and art galleries. The Italian culture is very rich and the people have great hospitality. That makes it so cozy to sit down town and enjoy the amazing food that is their specialty. In Italy food is not only for nutrition, but also one of the biggest joys in life. If you book through BlumenRiviera GmbH then all of these facilities and equipment will be available for you and from there you can find the perfect accommodation. They offer apartments that differ in sizes (space for 2 to 8 people) and some are located directly on the training site, but even more are situated just in walking or cycling distance.